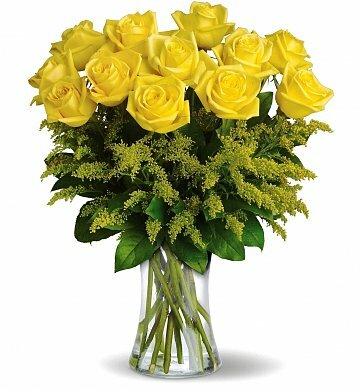 Destined to make anyone's day glow, this sunny bouquet of bright yellow roses is such a beautiful way to celebrate a friendship, birthday, or special occasion. One dozen 50 cm yellow roses sit atop fresh greenery such as solidago and salal. The bouquet's bright coloration and unique presentation make it the perfect gift to send a smile. Fresh Yellow Roses (50 cm). Rosy Glow Bouquet is a hand delivered gift. These gifts are delivered by one of our local design centers located throughout the United States and Canada. Same day delivery is available for most gifts when ordered before the cutoff time. The cutoff time for Rosy Glow Bouquet is 2 PM in the recipient's time zone. I think I would choose the longer stem. I think there was a little too much greenery. However, the bouquet was lovely. Couldn't go any better. The driver called me when they were not home when he delivered the first time. We worked it out~ Thanks so much!!! Most satisfying arrangement ever, more than helpful service... the best experience ever, will do lots more purchases....thanks so very much!!!! I arranged (long distance) for delivery to a restaurant for an anniversary dinner. When we arrived, the flowers were on our table and they were perfect! Thanks! Delivery in time for birthday party. Great service. I was concerned about time of day for delivery. Customer care was in touch promptly by email to ensure my family member received the package. The recipient could not be have been more impressed receiving such a pretty arrangement.